Jean has tagged me in a book spine poetry meme. Ali had done some. Here are some other examples. And here's mine. The top book is the title. Now to tag some others. Here are the rules. Create a book spine poem. Post it on your blog. Tag another blogger, or two, or ten. Tagging Matt, Rebecca, Ally, Jenny, Karen, Sharon, Amy, Sarah and Wendy. And if there is anyone out there who doesn't have a blog but wants to have a go, feel free to send me your photo in an email and I will post it here for you. I've been doing a group Bible study on prayer lately and one of the studies makes the point that prayer is talking to God, not listening to Him. God doesn't speak to us in prayer. We speak to Him. I was talking to my husband about this, who cleverly observed that it can be quite easy to get the wrong impression about God speaking to us, personally and audibly, from the pages of the Old Testament. You see, God spoke to Adam and Eve and Cain. And Abraham, Isaac and Jacob. He spoke to Samuel and Nathan. And to Elijah and Elisha. And God spoke to all those prophets who have books of the Old Testament named after them. There may be others. These are the ones I can recall off the top of my head. And when you put all the things He said to that collection of people together, it accounts for a good part of the Old Testament. Pages and pages and pages of God speaking personally and audibly. That's a lot of God speaking. But He only spoke to a small selection of people. Count them up. There aren't that many of them, for all the words of God recorded in the Bible. It was the responsibility of this small group to pass on the message of His words to the multitudes. God didn't speak to each and every Israelite camped out at Mt Sinai or to the wayward kings and commoners of Judah, Israel, Egypt or even Ninevah. Just to a handful of people whose role it was to pass on the message. And then in the New Testament He spoke through one man. Jesus. This is not to say that God couldn't speak personally and audibly to someone if He chose to. He is the Creator and sustainer of the universe. But given the pattern set in the Bible, it seems fairly likely that He speaks to people now far less often than many might otherwise suggest. I've never done the maths before (of how many God actually spoke to in the Bible) but it's pretty interesting - a small but important point to note. I've spent this year reading through the Prophets in my personal Bible reading time. It has been fantastic to give them the freshness of summer light and energy rather than crashing into them during the cold and dark winter months and dying, as has happened year after year. I worked through all of them over four months, with some help along the way from some online sermons, the occasional commentary and a little book called The Minor Prophets by Jack Lewis. I'm onto my second run through now, going a bit faster. It hasn't been an exhaustive study. My aim was to get some basic facility with them, so that when their names were mentioned the essentials would spring to mind, rather than being met with a black hole. It has been Bible reading time well spent. I am hoping to be finished the second run through by the end of June and then plan to do a dash through the whole Bible during the second half of the year. (That may be being a little optimistic. I'll let you know how I go.) I'm liking this plan a lot and am thinking that I will do it again in future years - giving the first few months over to something specific (so maybe next year I will take on just Isaiah with a commentary or Job or...) and then going through the whole Bible after that. Here are some things I have noticed about the Prophets, from my first sweep through. At one level, they all basically say the same thing. They're all messages from God through individual prophets to various nations, cities or kings to repent of their current godless practices and to turn and follow Him. It is often presented, just as God first spoke to the Israelites through Moses in Deuteronomy, in terms of blessing and cursing. Sometimes the message is delivered in very black and white terms. And on first glance it can seem quite harsh. But while that message is being delivered, God has not drawn down on His sentence. With abundant mercy, He is throwing out a lifeline. At other times the words of the Prophets are heavy with God's compassion for His people. He aches for them to turn back to Him. It is tender reading. We know, looking back in a purely historical sense, that God did bring down judgment on His people. The Northern Kingdom was overtaken by Assyria and the residents of the Southern Kingdom were taken into exile by the Babylonians. It is grim reading, as these events unfold. And it is easy to wonder where God is in the lives of the innocent bystanders - in the lives of the humble Israelites who loved God while all those around them were serving false gods, following their own way and receiving their due punishment. It doesn't seem to fair to bring down such harsh judgement on the innocent. But there are small passages here and there throughout the Prophets where God addresses this. As humans, when the chips are down, we fear for our mortal lives and seek to avoid pain and hardship. But God's purposes are much higher and are eternal. There is an especially moving example of this in Isaiah. The Day of the Lord is a common theme throughout the Prophets. Interesting to note that some the Prophets talk about this day as one which will be glorious beyond imagining. They almost turn themselves inside out trying to express the wonder of it all. But others paint a more sober view, explaining in clear terms that it is a day to be feared. It is a day which will bring judgment and great distress and for those who have ignored the call to follow God, it will not end well. Another interesting thing I noted was that there is lots of evidence that God's people will be found amongst the Gentiles as well as the Jews. Paul certainly draws attention to this in Romans 15. I did find myself wondering, given the weight of the evidence, why there was so much shock about the place in the very early church when the Gospel made its first push out into the Gentiles. Maybe they all hadn't read the Prophets. 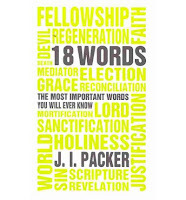 In God's good providence I was reading through the Prophets while being swept away with JI Packer's Knowing God. And this section of the Bible certainly gives you the BIG PICTURE of God in all His holiness, right to judge, power, love and compassion. I have been both humbled before Him (the fear of the Lord in its fullest sense) and strengthened in His grace, love and mercy. Not easy. But good and rich reading. 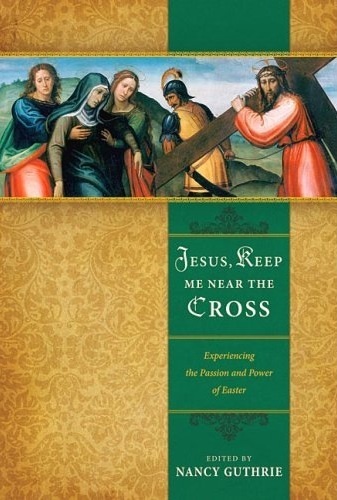 I didn't have a chance to get near Jesus, Keep Me Near The Cross in the lead up to Easter so I read it after Easter instead. This book is wonderful in and out of season. Here's a passage from near the end that taught me something and encouraged me to press on in keeping near the cross of Jesus. Four of the last seven words [of Jesus on the cross] were from the Old Testament. Only Jesus' direct addresses to God on behalf of the soldiers, to the dying thief, and to his mother and beloved disciple were not. This means that Jesus was filling his mind and strengthening his spirit not by trying to keep a stiff upper lip or look for a silver lining, as we might say, but by an act of deliberately remembering and consciously clinging to the great prophecies and promises of God. If Jesus did that, don't you think you should do it too? And not only when you come to die. You need to fill your head with Scripture and think of your life in terms of the promises of Scripture now. If you do not do it now, how will you ever find strength to do it when you come to die? You must live Scripture, committing your spirit into the hands of God day by day if you are to yield your spirit into God's loving hands trustingly at the last. From "The Heart of the Cross" by James Montgomery Boice and Philip Graham Ryken (page 100) in Jesus, Keep Me Near The Cross edited by Nancy Guthrie. A little while ago I came into possession of a document I wrote ten or more years ago called "The Top Twenty Teaching Tips for Children's Church Teachers." I've just read over it and I'm interested to find that I would probably knock out five, maybe ten, of the tips I listed. Amazing what a difference a decade will make. And there is one tip - one that I would put close to the top these day - that isn't mentioned at all in the list. Get the kids to multitask. I teach a few Scripture classes each week at our local primary school. In recent weeks I have had more bad lessons than good. I take the upper primary classes and in my experience, things start getting difficult with these groups about three weeks before the end of term three - so it was a bit disconcerting when things started going downhill so early on in the year. It could make for a very long and difficult year. I decided I had to do something to turn things around. And quickly. So I did what I do in Sunday School. I got them to multitask. When I teach Sunday School and I need the children to listen for a long time (big story, complicated point to explain, it's a serious lesson and breaking up the talking with a game just won't work) I often bring out a big bowl of popcorn. Children will listen for as long as you want to talk if they have something to eat. (You do have to get over the fact that at least one child will eat as if they hadn't been fed for a whole week, but other than that and potential popcorn allergies, this strategy is foolproof.) Other things that work include playdough or a small pile of Lego bricks with instructions to build a specific thing. 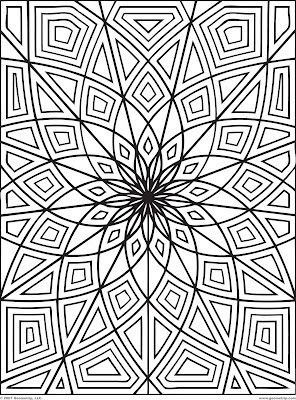 So I went to dear old Google Images and typed in "Detailed Geometric Colouring Pages" and got something like this. It wasn't this one exactly because every time I google these words I get a completely different set of pictures. Which is good. Endless possibilities. Anyway, I printed one off, photocopied it and went to my lessons. After a pretty good opening (a couple of rounds of our apple stacking challenge and then the story about how I thought I was going to be killed at the hands of two bikies one evening when I was about 20 and my car broke down in the middle of an intersection at night will hold most children...and yes, it did have something to do with the Scripture lesson I was teaching) it was time to get down to serious business and on cue, they started in on me. So I whipped out my pictures, gave the instruction that no two bits were to be coloured in the same colour and kept teaching. They coloured. They listened. They answered questions - without calling out. And when it was needed, they put their pictures aside to do five minutes of writing in their workbooks. Because they knew what had happened in the Bible story and they were calm. 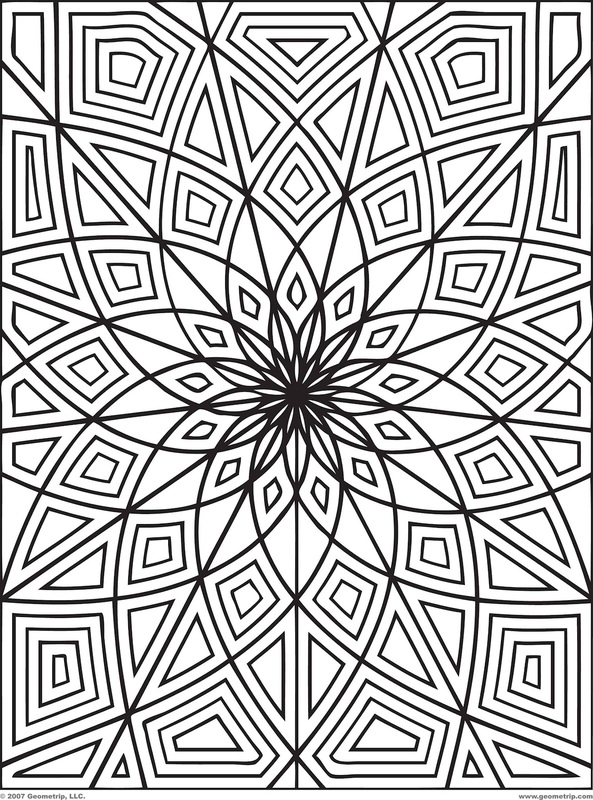 The colouring in picture had nothing to do with the lesson at all. All it did was distract them from the task of winding me up for long enough to get the content of the lesson across. Twenty years ago (oh my...) when I was a classroom teacher I would read from a novel to my class every day. Either before lunch or just before the end of school. And I would make sure they had cleared their desks completely before I started. There was no fiddling with things, drawing while they were listening, nothing. I wanted them to do nothing but listen and use their imaginations as I read. And they did it. Not because I was a tyrant about it. They could just do it, with a little bit of training at the beginning of the year. And that is why mulitasking didn't rate a mention on my Top Twenty List. It wasn't needed and in my humble opinion, it just didn't help things along. But I don't know if children would be able to do that now. Sure, some can. But not whole classrooms full of children. Not without lots and lots of training - in concentration and respect. And the 30 minute Scripture lesson is not the time of the week for that. So instead, multitasking is a technique that keeps hands and minds out of mischief and allows for the lesson to proceed. It won't work every week. And this won't work week after week. But, thanks be to God, it worked this week for me. We had a nice time together and that means that I stand a fair chance of having a good week with them next week as well. And I hope that as I share bits and pieces here and there (as I said, I am planning that this will be an occasional series rather than a "post after post" type arrangement) that someone out there, maybe struggling with their teaching, might be encouraged to press on. What follows right now is a post on getting kids to multitask to get the ball rolling, inspired by a dramatic turn around in my Scripture classes this week. And I need some help. Anyone got an idea for a series title that captures the imagination a bit more than "Teaching Kids about God"? It's alright, but I think we can do better. And any ideas for a signature photo for this series? Update: Here is the photo that will accompany these posts. Thank you so much to Cathy. I was finding it a bit hard to settle into a new book after finishing Knowing God. 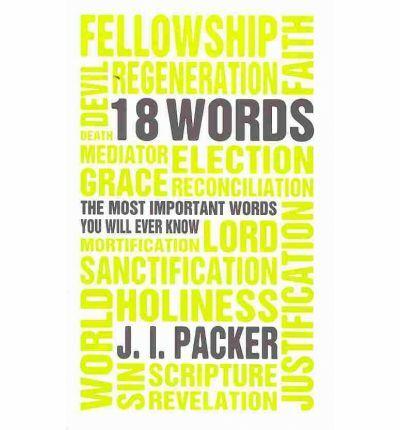 I'd been hoping that my copy of 18 Words: The Most Important Words You Will Ever Know, another book by JI Packer, would arrive in time to coincide with coming to the end of Knowing God. The postpak that should have contained 18 Words arrived in good time, but with the wrong book. Messages sent back and forth, apology accepted and a new copy in the post to catch that day's mail - and yesterday it arrived in my letterbox. 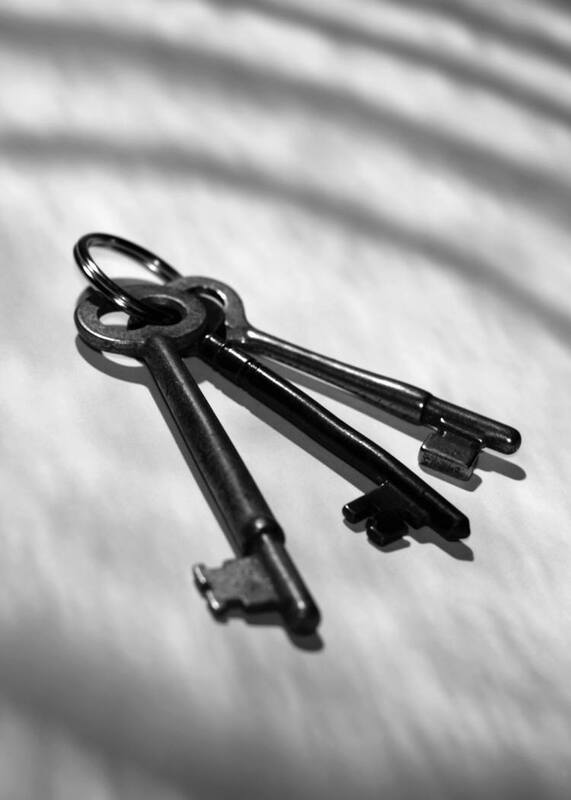 Keys open doors; keywords open minds, and through minds hearts. This book takes keywords from the Bible - terms, we may truly say, from God's own vocabulary - and spells out in a particular way some of the main thoughts linked with them. The goal is understanding, faith and wisdom. Deep, contented sigh. Very happy.